I went to my Vet and I didn't like it, but I survived. Lynettea made a special appointment with my Personal Vet so I could have my Annual Check Up and Vaccinations. He nearly didn't give me vaccinations, but Lynettea was concerned, so he did. I don't like being FELT ALL OVER, which is not very private. My Vet said I had put on some weight, which was a good sign. Lynettea said I looked rather a magnificent cat and he agreed. I have my doubts about Lynettea though. How can she expect me to trust her when she lures me down from my walkway (where I am resting in the sunshine) and then thrusts me into a small confining cage? And I don't like going in taxi's. I think I need a coach of some sort. It doesn't have to be gold plated. Labels: felt all over, Personal Vet, taxi ride. Thanks Huffle for the awardie. I think your comment is quite correct. I do have problems with Lynettea as she is very slack about letting me get near the computer. I have to keep reminding her about all sorts of things lately. I have to do all sorts of linking and writing on other blogs for this award. I might have to do it later, because I think it is time I supervised Lynettea to get to bed. If we are up too late she might be even worse at helping me tomorrow. The latest thing is that she won't let me attempt to catch the rats that are eating the grapes because she is afraid I might get rat bites. So as soon as she sees me looking into the ferns she picks me up. I can't get into my fern hollow any more, as the ferns have grown over it, so I have to listen to rat sounds from the path. AND THANK YOU ADAN AND LEGO FOR THE LOVELY CARD FROM TAIWAN. Lynettea is jealous, as she never gets a card from Taiwan. Michico has done me a lovely painting of Adan and Lego. I wasn't very pleased to see that my haiku did not rate a mention in the review of the Haiku Bindii journal. You will remember that Lynettea used some of my haiku in the book without crediting me. I feel sure that if my name had been credited I would have done better. I notice that no poems with cats in them have been quoted. My card and disc came yesterday, so Lynettea says I am now an official Bequest Pet. She has to carry my card around with her in case anything happens to her. Then if it does (which I hope it won't) somebody would find the card and see that there was a special pet to be looked after and ring the RSPCA emergency number IMMEDIATELY, so someone could rush to my side. As I don't wear a collar, I couldn't have the disc attached to me. I am an inside cat, so I just have my microchip. I am not sure where the microchip is. We weren't sure what to do with the disc, so Lynettea put it around the neck of the model of the ancient Egyptian cat on the dresser. Lynettea got the model at the Egyptian exhibition when it came to the SA Museum. I couldn't go because cats were, as usual, excluded. Which is rather odd, as the Ancient Egyptians regarded cats as sacred. 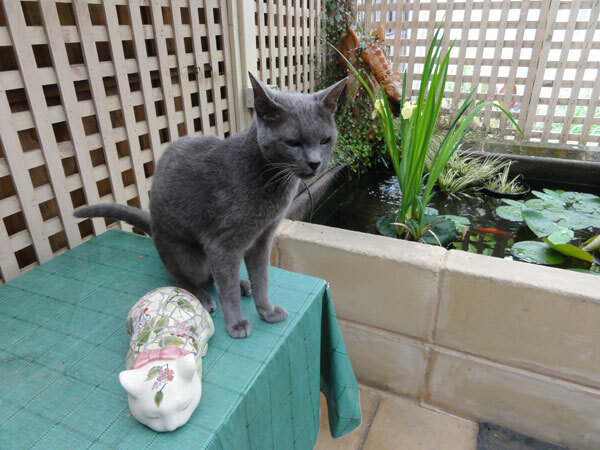 I am not sure about the cat near me in my picture. It doesn't move around at all, so I don't bother with it too much. I think Lynettea should have moved it to give a better view of my noble form. Lynettea tells me that my blog cannot be seen in China. How disappointing for all the many cats in China. Also my Friendship Bear Emma cannot see my blog. Maybe they think I have a seditious blog. Maybe I am a politically incorrect cat? nǐ hǎo to all the cats in China. I wonder if any Chinese cats have their own blogs. I would like to see one. Labels: my blog available in China? 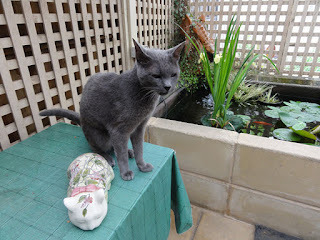 I haven't made an official first post for 2012 yet, because of the difference in time from where I live in Adelaide to wherever the hosts of my blog live in Catland. Catland is behind Adelaide in time. Maybe that gives me a second chance, before the real Catland time comes around. I could change my mind numerous times before it was the real time. I can hear Lynettea saying, 'Don't be silly Diamond!' She is always saying things like that. We will see who is the silly one. Miaow Miaow Miaow Miaow and for a change Purr Purr Purr Purr. I am lying on the table in the kitchen on a few of my newspapers. I am feeling so drowsy that I can't even be bothered to read them. Just managed to choke down some chicken after Lynettea put it right in front of my mouth and I think I will now do some serious miaowing. A chorus of miaowing to bring in the New Year. Happy New Year to all kitties and their humans.